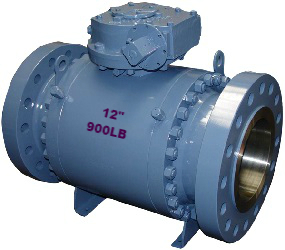 A metal seated trunnion ball valve, forged steel 3 pieces body, side entry, gear operated, 12″ 900LB RF API 6D. 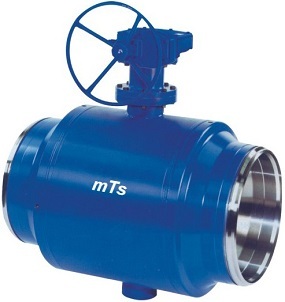 The metal seated trunnion ball valve has two prominent features: metal to metal seating and trunnion mounted ball design. These valves have been widespread in severe service applications where pipeline flow may contain solids and harsh corrosives, operating at elevated temperatures and high pressures. The trunnion mounted ball can be fixed by bearing pads in the body, by trunnions or by bearing stems. Both the ball and the metal seat ring will be precisely machined/ ground and enhanced by high velocity oxygen fuel(HVOF) coating process. 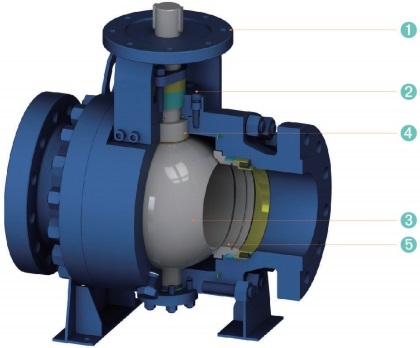 Metal seated trunnion ball valves have many advantages such as excellent corrosion & wear resistance, tight shut-off, smooth control, low torque, wide temperature & pressure range, as well as stability under pressure. Design standards: API 6D, API 608, BS 5351, ISO 14313, ASME B16.34; Size range: 2″~40″; Pressure ratings: 150LB~2500LB; End connection: ASME B16.5, ASME B16.25, ASME B16.11; Face to face: ASME B16.10; Inspection and test: API 598, API 6D, EN 12266-1. 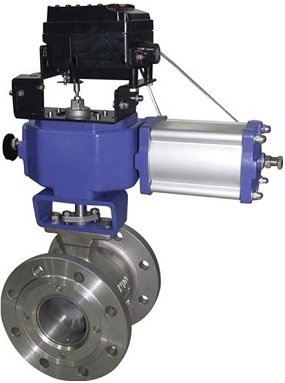 The metal seated trunnion ball valve is available in either full port(FB) or reduced port(RB), 3-piece or 2-piece split body and side entry, lever/gear or actuator operated. Serial No. : MTBV13. 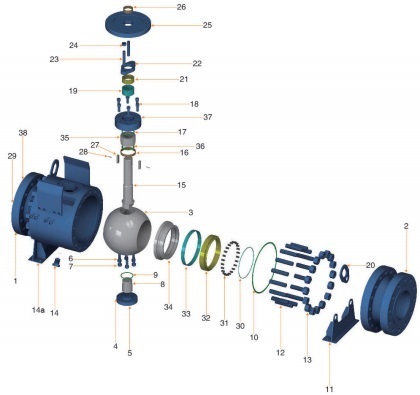 See the technical drawings and dimensions of MTBV13. The design features of forged steel metal seated trunnion ball valve, 2 piece or 3 piece split body, side entry with ISO 5211 mounting pad. (1) ISO 5211 mounting pad to facilitate the assembly of actuators. (3) The sealing area of both seat ring and ball is HVOF coating with Tungsten Carbide-Cobalt(WC-Co). (4) The seat is spring-energized to ensure low-pressure tightness. (5) Diverse seating patterns including self-cleaning design. The 3D explosive view of a typical metal seated trunnion ball valve, forged steel 3 piece split body, side entry. 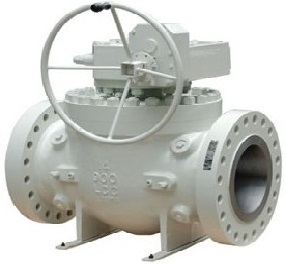 The material selection of forged steel metal seated trunnion ball valve, 2-pc or 3-pc split body and side entry design.Other materials are available upon request.